The card is signed by the entire First Family, including Bo, whose paw print adorns the inside. Unlike President Obama’s card, Bush’s references to verses from the Bible did at least remind us that Jesus was the reason for the season. In the current White House, no such attempt is made. 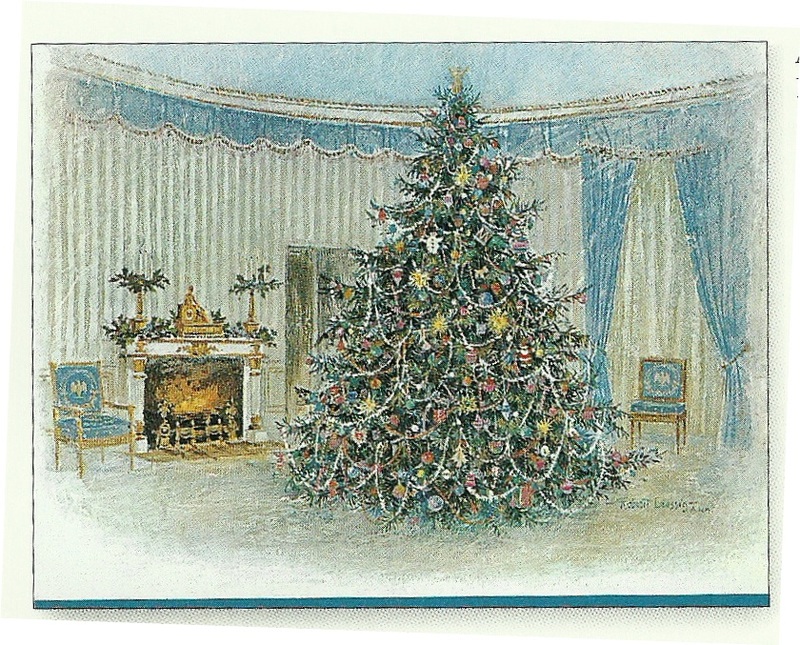 Despite the politics and criticisms behind the Obama White House cards, they will soon be a part of a now relatively long historical tradition of White House holiday messages that goes back at least 89 years. In 1923 , Lucretia Walker Hardy, the acting general director of the Community Center Department of the District of Columbia Public Schools wrote a letter to President Calvin Coolidge’s secretary, C. Bascom Slemp. The letter gave birth to a White House tradition that is now taken for granted when carried out, but would practically force a President outr of office if they failed to follow through with. The letter actually gave rise to two White House traditions, the National Christmas Tree and the White House Christmas, or season’s greetings cards. In her letter, Lucretia Walker Hardy wrote, ‘The event which Christmas commemorates means more to to the world as a whole than any other holiday we observe”. She added “The tree would be outward evidence of the President’s desire to give encouragement to the spirit of which it is symbolic”. 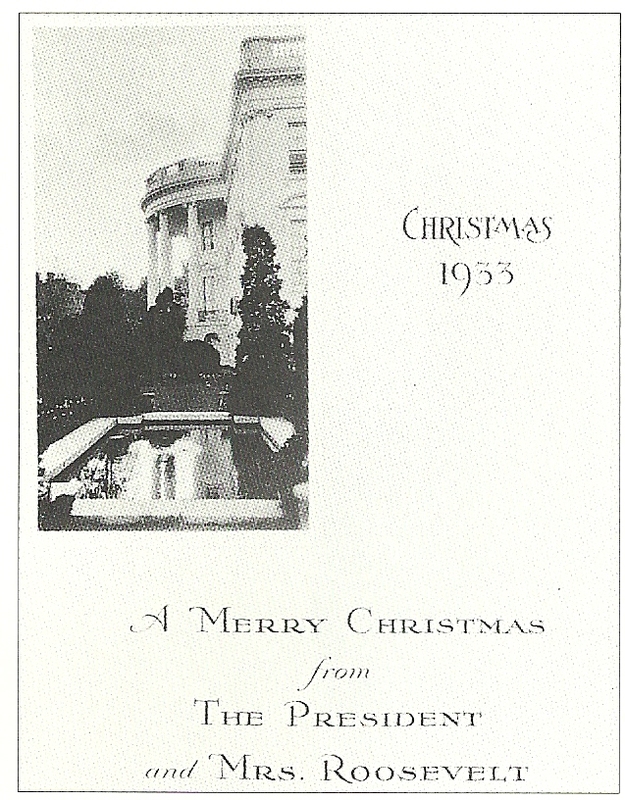 Hardy suggested that the tree come from President Coolidge’s native state of Vermont and after offering volunteering her public schools department for the purpose of erecting and decorating the tree, she invited President Coolidge to officiate over it’s lighting on Christmas Eve. 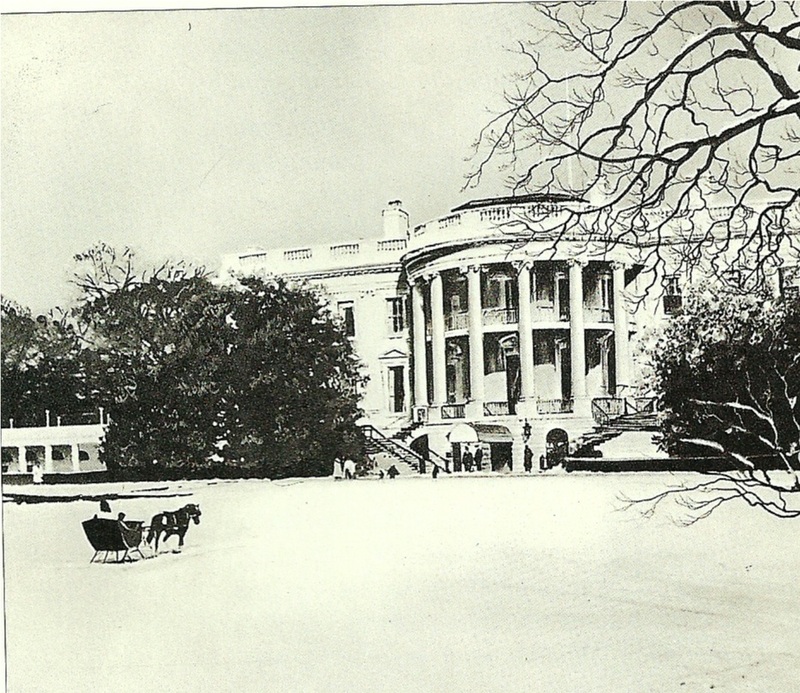 Due to a public event that the First Lady had already scheduled, the President’s Secretary had to deny Hardy’s request to use White House grounds for the ceremony on Christmas Eve, but the Ellipse was chosen as a suitable alternative for the event. “Middlebury College counts it as a privilege to send to you, from its forest preserve in the heart of the Green Mountains , a National Christmas Tree. It is our hope that this Vermont Tree when electrically illuminated in Washington will contribute toward a spread of the Christmas spirit throughout the nation”. On December 18th, the 60 foot fir tree was delivered to the Ellipse, and under the supervision and services of the Potomac Electric Power Company, the tree was hauled in to place, just south of the Department of Treasury. The whole operation cost $500 and it included the expense of adding an electronic button that would allow the President to light the tree from the Executive Office. At 5:05 pm, after walking to the Ellipse, President Coolidge stepped on the electronic button and lit the 3,000 light bulbs that adorned what was the nation’s first National Christmas Tree. While “Silent Cal” did not deliver a speech at the lighting ceremony, a choir and quartet played with great fanfare and at 7:00 PM the Marine Band played holiday music in a concert before thousands of spirited spectators. 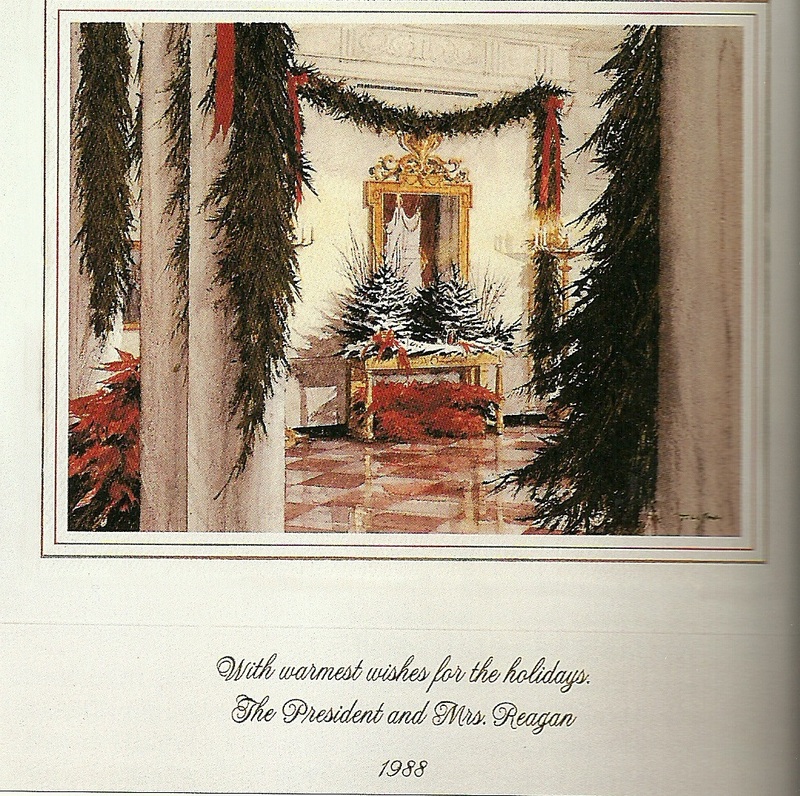 Two hours later, Grace Coolidge orchestrated another display of holiday joy from the White House. Inspired by the the hymns she listened to at her church, Grace arranged for the appearance of 65 members of the First Congregation Church for the singing of Christmas carols. With the help of the Chesapeake and Potomac Telephone Company, the event was heard by an estimated 1 million people via a broadcast over the radio station WCAP. “From the steps of the White House there went forth last night a message of peace on earth, goodwill to me. It was the message echoing down through the ages from the days of the three shepherds, and as it passed from the throats of a choir on the portico of the White House, it was echoed by the President and his family and thousands of citizens, all in harmony with the re-echo in the hearts of the people of the nation and the rest of the world. It was the reverence of a Christian people giving at the seat of their government the expression of their praise for the “King of Kings” on the eve of his birth”. That first Christmas at the White House for the First Family, was the last that they would all spend together. In the summer of 1924, 16 year old Calvin, Jr. died from Staphylococcus septicemia or as it is more commonly known ……. a staph infection, something which typically starts out on the skin but may enter the bloodstream through a cut or other opening in the skin. 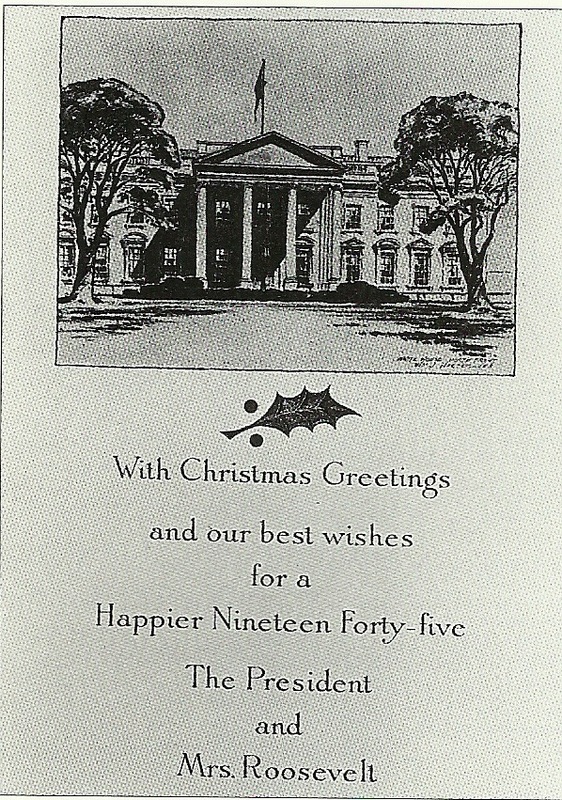 However, in the years to follow, the public events of their first Christmas in the White House continued and in 1927 Coolidge wrote the first presidential Christmas message designed to address the nation as a whole. 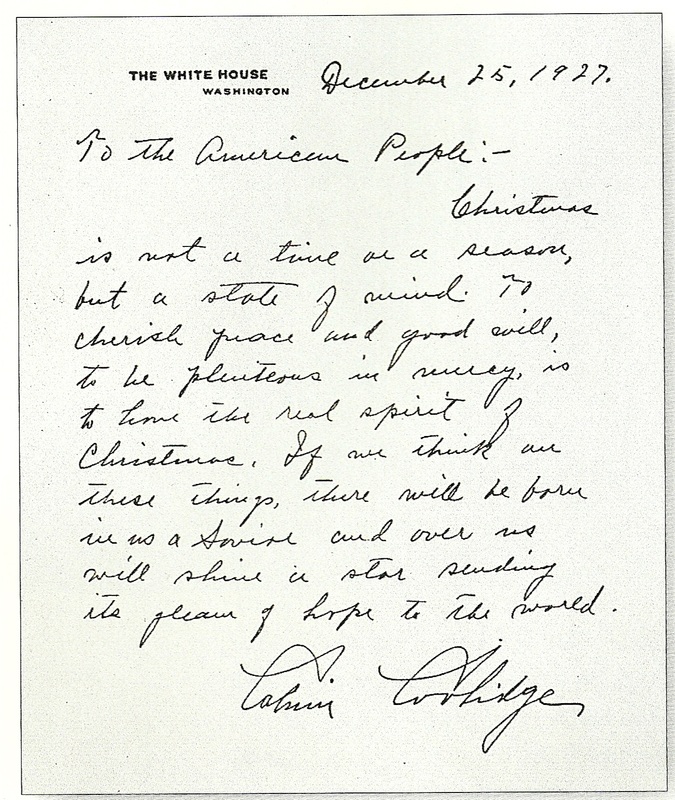 It appeared in every major newspaper on Christmas morning and received an overwhelmingly appreciative response that prompted thousands of telegrams to the White House which praised Coolidge for his heartfelt expression. 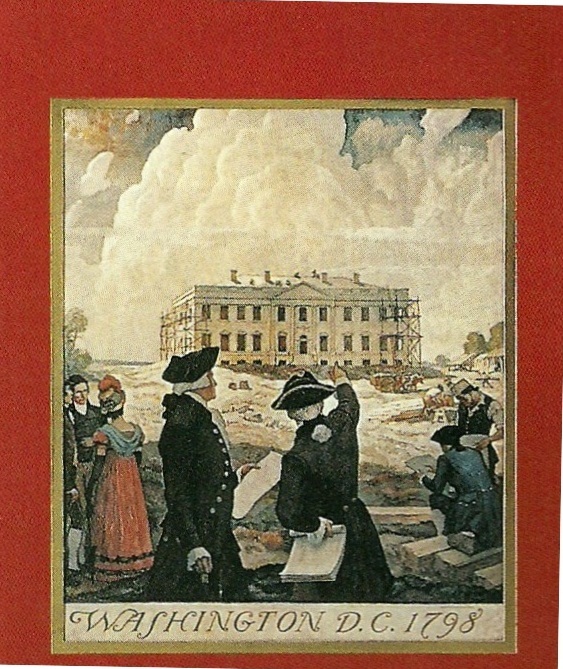 As is the case with all traditions, they begin to take a life of their own as they experience a process of natural evolution that incorporates such things as public sentiments and trends, technology, and other influences, yet through it all, no matter what new spin is added, traditions all begin with first steps and in the case of the White House Christmas cards, those steps were taken by the Coolidges. 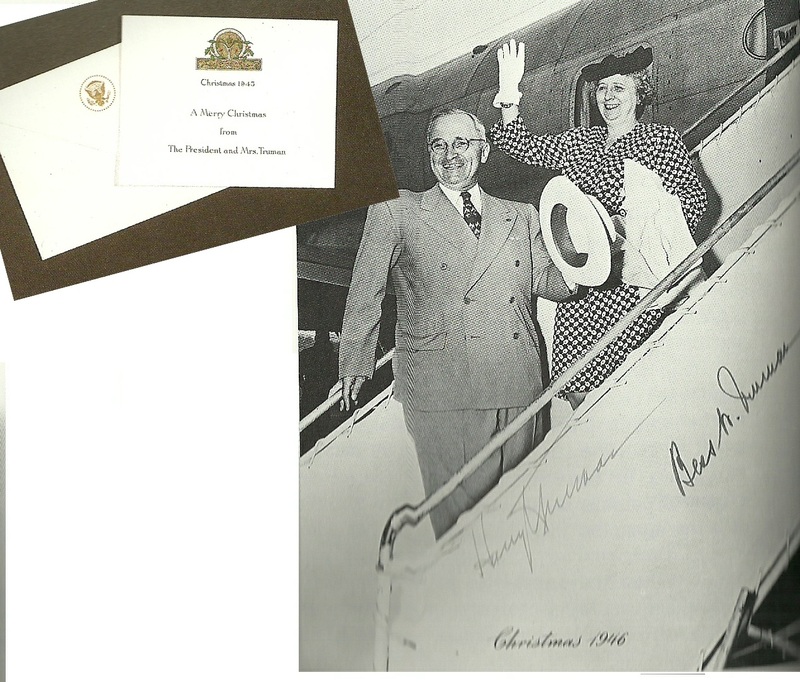 In 1946 the Trumans designed 800 of the following enclosures that went along with the picture shown below of the Trumans boarding the President’s private plane. Between 1948 and 1952, Harry and Bess Truman lived in Blair House as the White House underwent renovations. So the President directed the Government Printing Office to print 1,000 copies of the following photo of the Blair House. 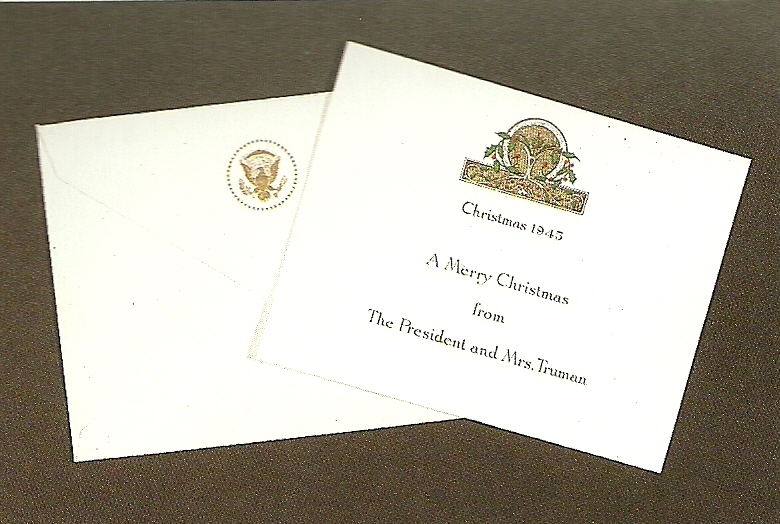 It was given as gifts to the White House staff by President Truman during a 1951 pre-Christmas ceremony on December 22nd. “As you know I always hate to inflict art on my friends and members of my staff, but Hallmark makes such a beautiful package job that I am, and I hope others are, distracted into the belief that the whole thing is a superior product”. 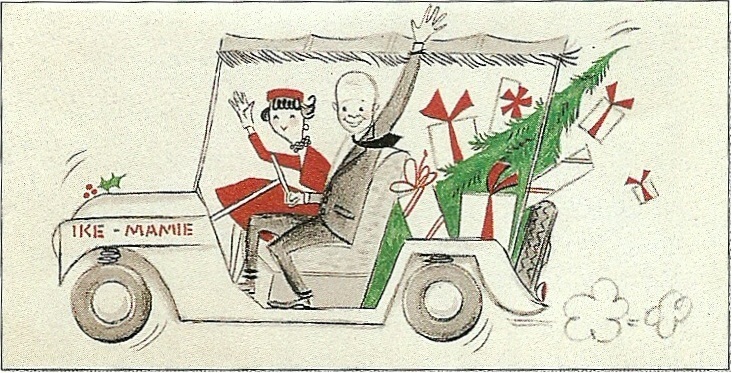 An interesting story accompanies the second Eisenhower Christmas card. 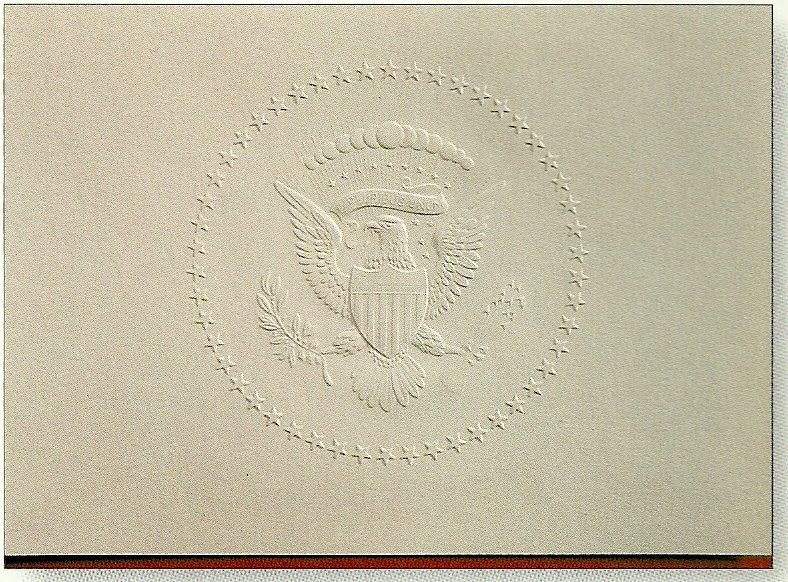 Hallmark designed two personal cards for the President and First Lady. 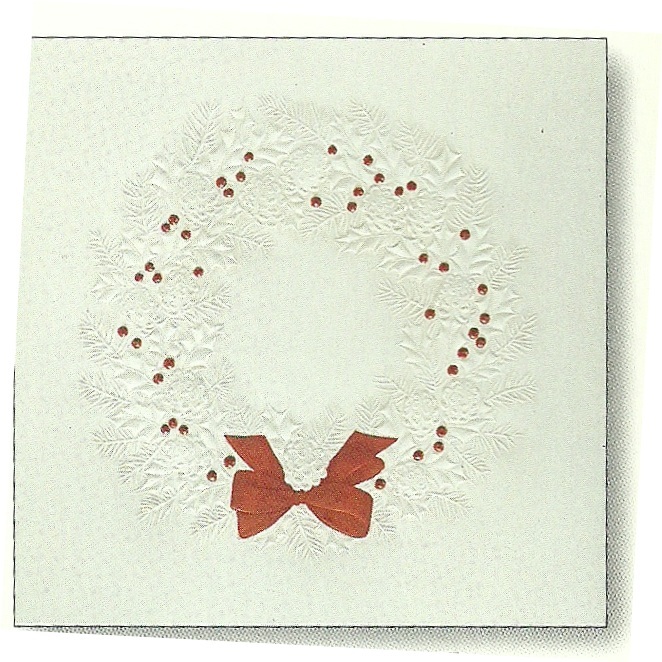 One was a white card embossed with with a wreath along with a red bow and red berries. According Mary Evans Seeley, the day the cards were going to be shipped staff discovered that the ink from the red ribbon and berries were smearing on each of the cards. Suddenly, dozens of Hallmark artists were recruited in to an emergency operation which forced them to place a dab of clear nail polish on each berry and bow. The smudging crisis was solved and the cards were shipped to the White House via TWA. 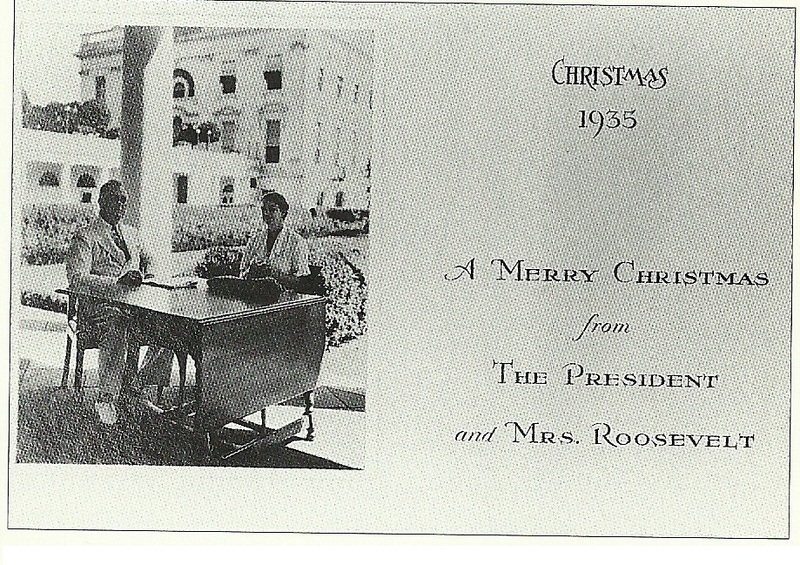 The other personal card became a favorite of the First Lady. 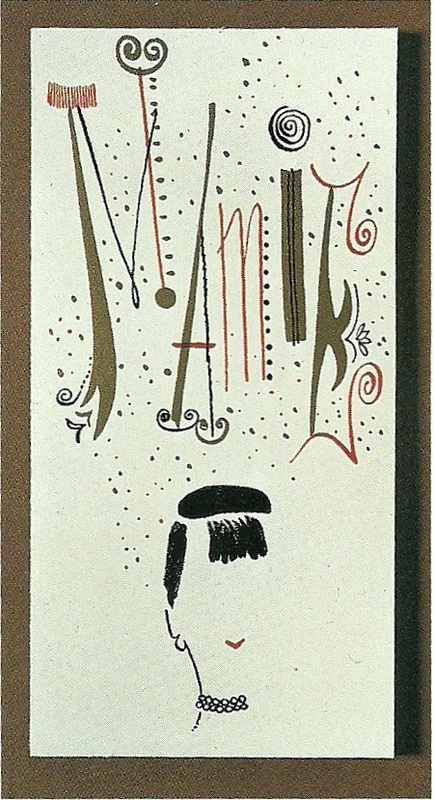 It was trademarked as the “Mamie Bangs” card and caricatured Mamie Eisenhower’s characteristic bangs. 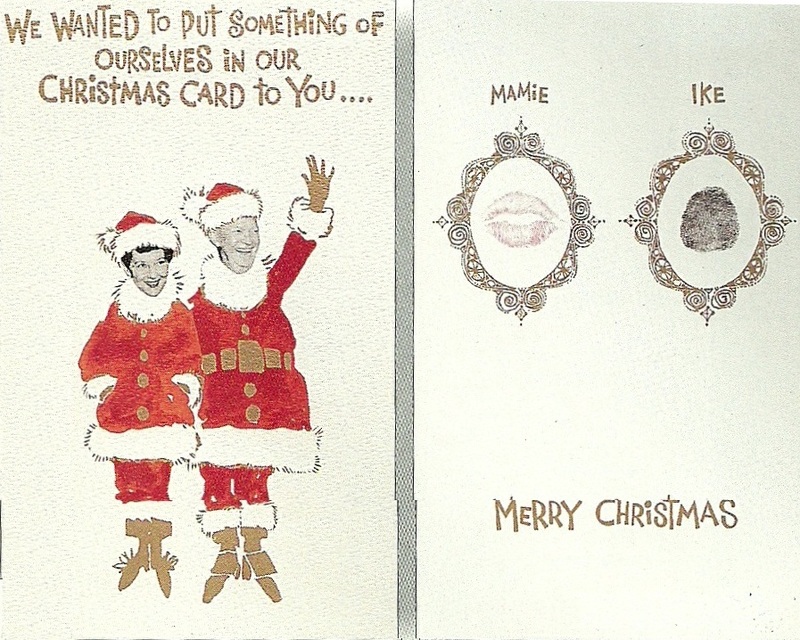 And here is the very contemporary Christmas card provided by the Eisenhowers in 1958. With the entrance of Kennedy’s in the White House came the touch of refined tastes that did not allow for caricatures and the bland and drab. 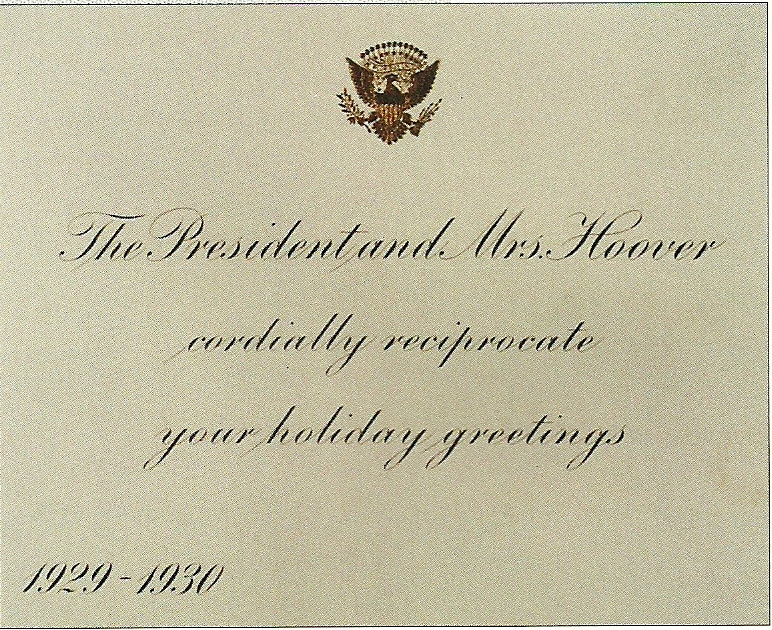 So After Hallmark designed a a Christmas card that was similar to one the Eisenhower’s used, Jackie took special care to add her own touch to the now traditional presidential season greetings. In 1962 after Jackie oversaw an extensive updating of the White House and then introduced the nation to her home in a nationally televised tour, the home furnishings editor of the Philadelphia Bulletin want to do a special spread on the First Family’s updated digs. But after sending a photographer to take pictures of the renovated home, the editor rejected them and instead sent over Edward and advertising-illustrator artist to draw some sketches instead. 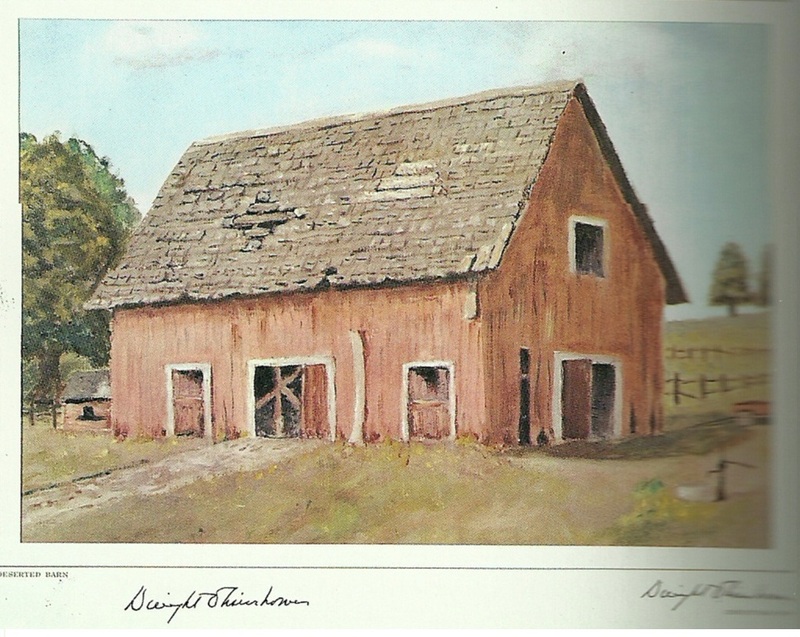 While doing one of his sketches, Mrs. Kennedy happened to see Lehman, got in to a discussion and was impressed by his work. 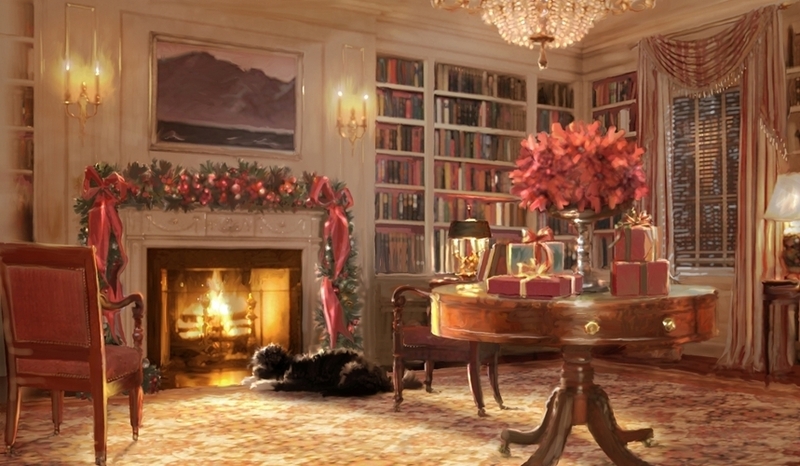 After a particular Lehman painting of the Red Room appeared in the Philadelphia Bulletin, the Kennedy’s were extremely impressed and Jacki soon turned Lehman’s painting of the White House into cards Christmas Cards and gifts. 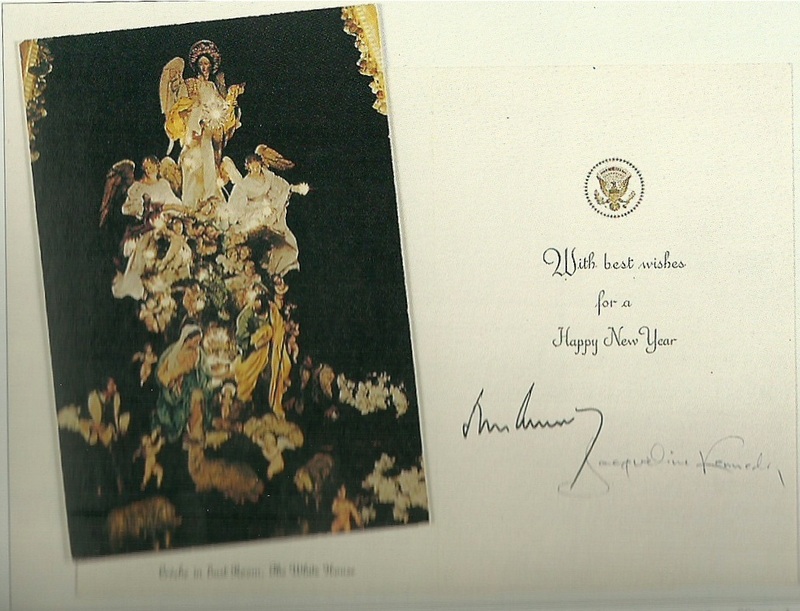 A few days before President and Mrs. Kennedy departed for Texas in an attempt to begin his campaign for reelection, 500 special Christmas cards featuring a crèche that was in the Green Room of the White House, were delivered to the White House. 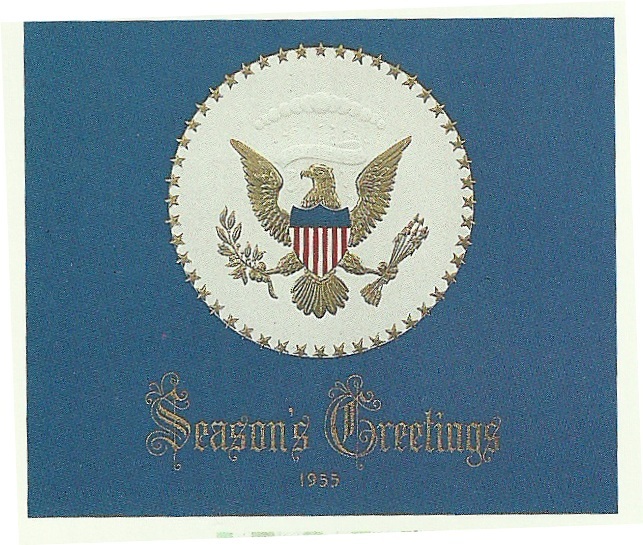 With the holiday season under way and Christmas fast approaching, they began to sign these cards on November 20, 1963. Mrs. Kennedy signed in blue ink and the President signed in black. The few cards that were signed had not yet been mailed and after the tragic events of November 22, 1963, they never were. In fact, at the time there was no record of the cards, not even in the Kennedy Library. But in 1985 fewer than 30 of these dual signed cards were discovered. 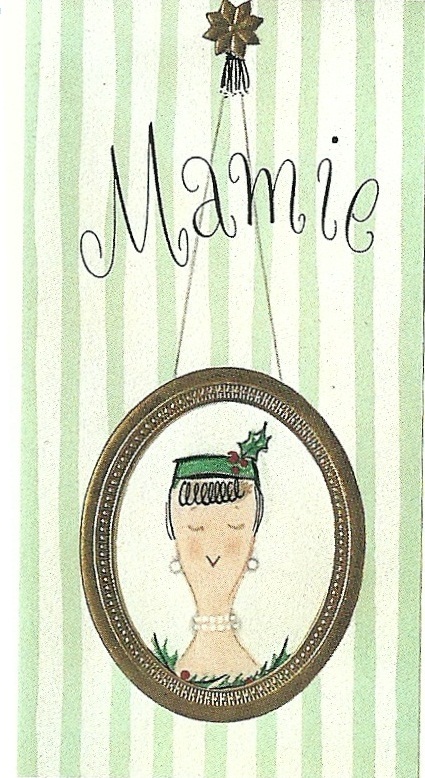 They are now perhaps both the saddest and rarest Christmas cards in American history. 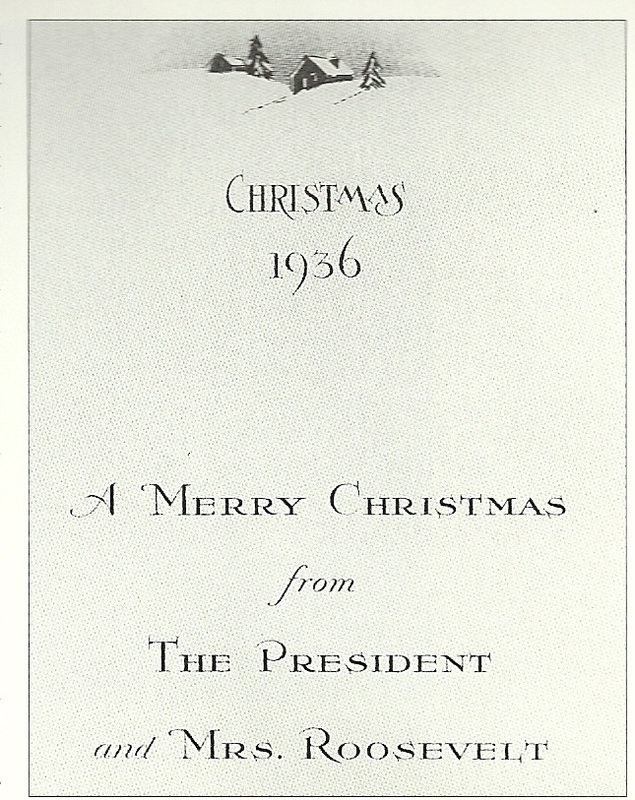 5 days after taking office upon the tragic death of President Kennedy, the State Department asked President Johnson what he wanted to do in regards to a Christmas card. The decision was made to send our a very simple and sedate season greeting. 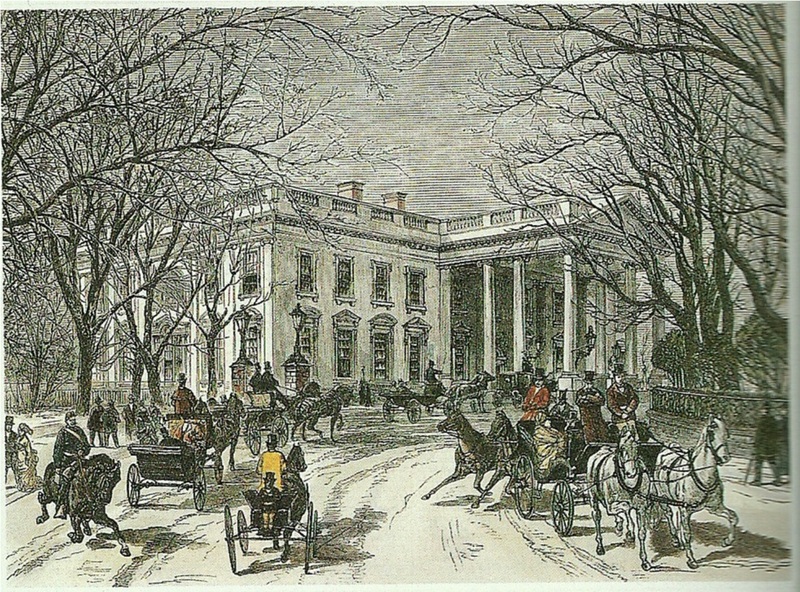 The painting above is a work by Thomas Williams Jones and it is of the North entry to the White House. 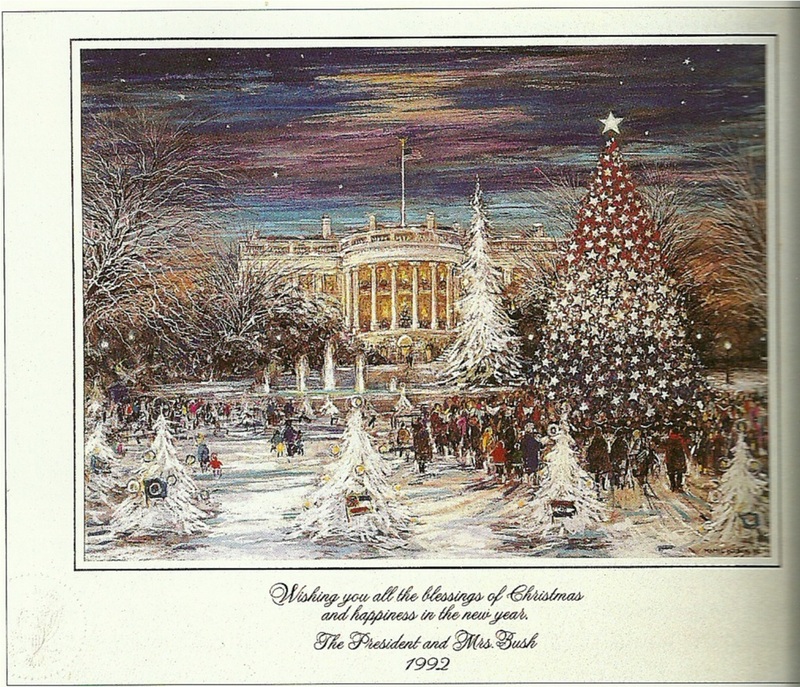 It became the cover for this 1988 official Christmas card for the Reagans. 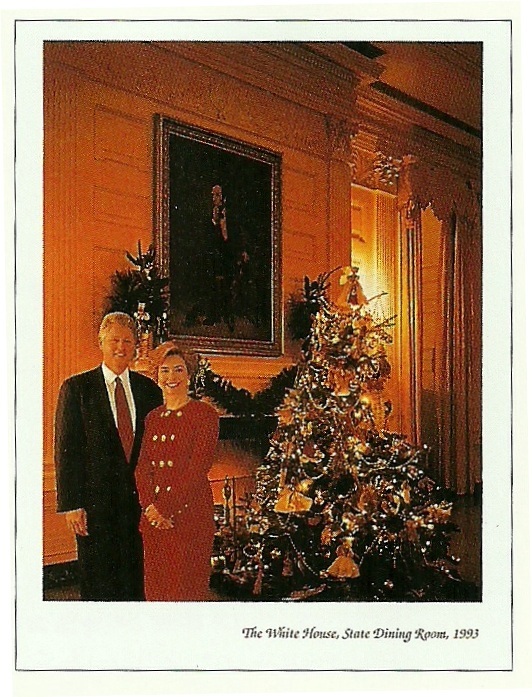 As the Clinton’s moved in to the White House, Hallmark kind of lost its historic place in the handling of the White House Christmas. Instead the Clinton’s chose to go with American Greetings, a greetings card competitor to Hallmark that was a longtime friend of the Clinton’s, big financial supporter of his campaign, and a member of the American Greetings Board of Governors. So in 1993, the Clinton’s received Charlie Riddle, creative director for American Greetings, and they worked with him on developing a Christmas card photo of the First Couple that conveyed the exact sense of wholesomeness and warmth that the First Lady specifically requested. The end product was the photo used on the card below. 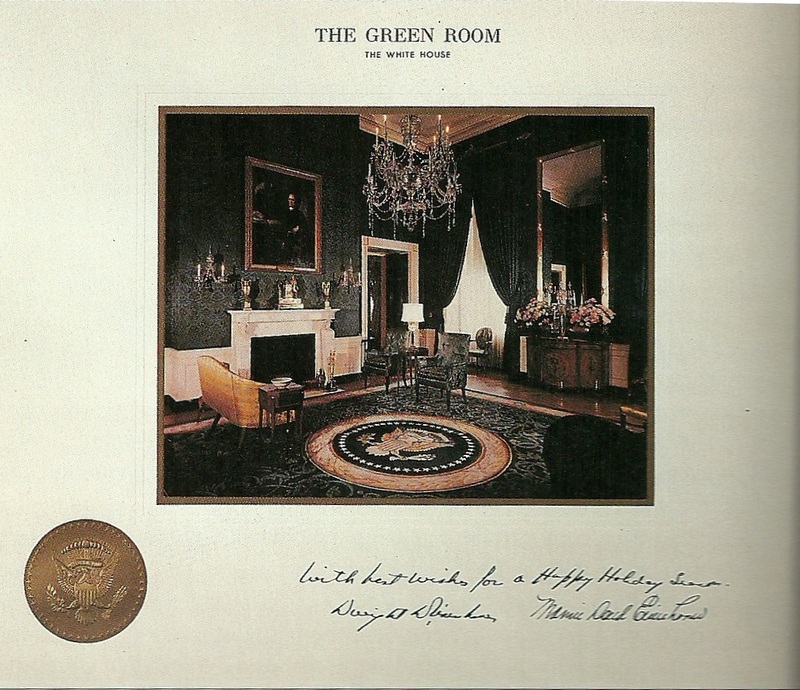 It features the President and Mrs. Clinton in the State Dining Room, next to a Christmas Tree and off to the side of a fireplace with the Lincoln portrait hanging right above it. 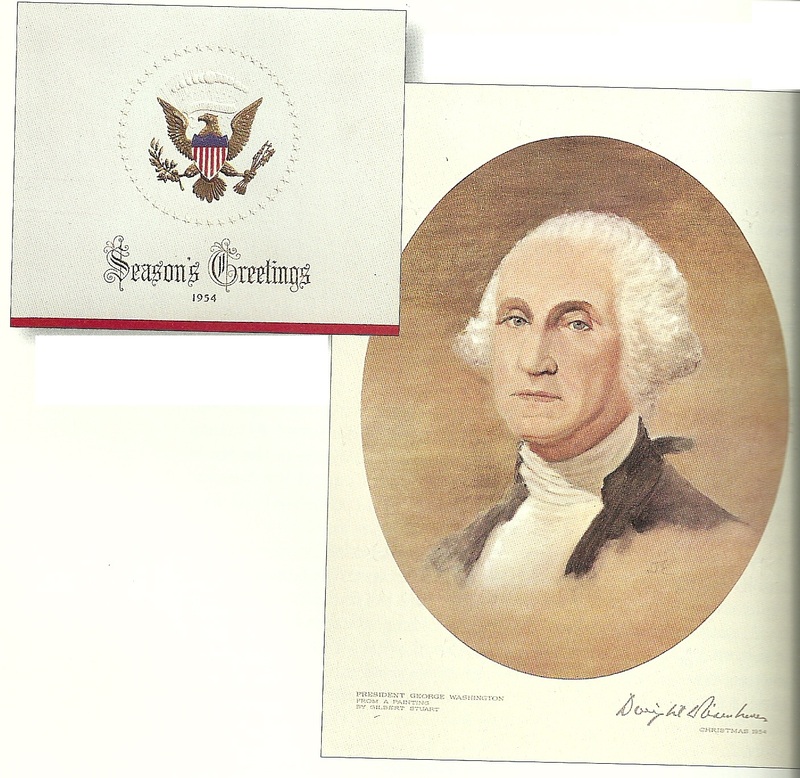 In 2002 Hallmark was back in the game of prersidential greetings as President George W. Bush and First Lady Laura Bush began a tradition of including Bible verses in their season’s greetings. 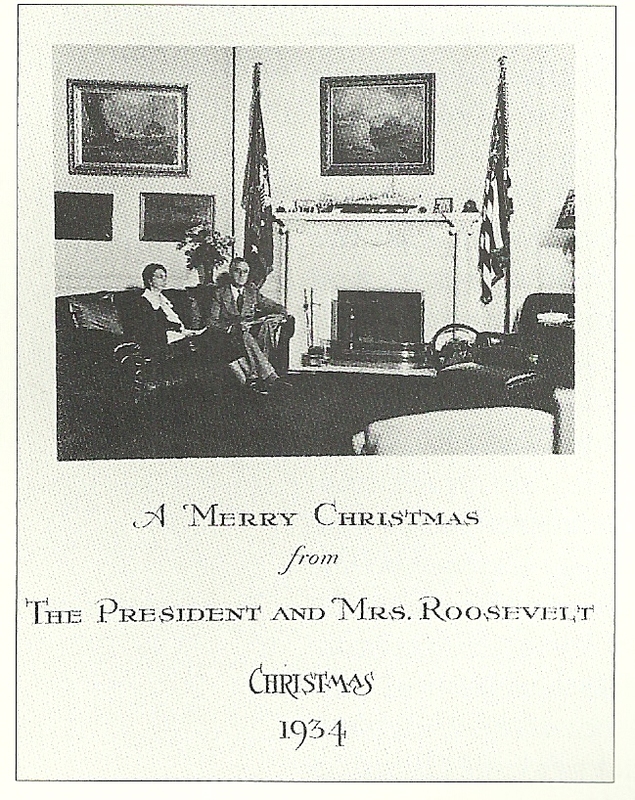 This card featured a 1938 Steinway piano housed in the Grand Foyer of the White House. 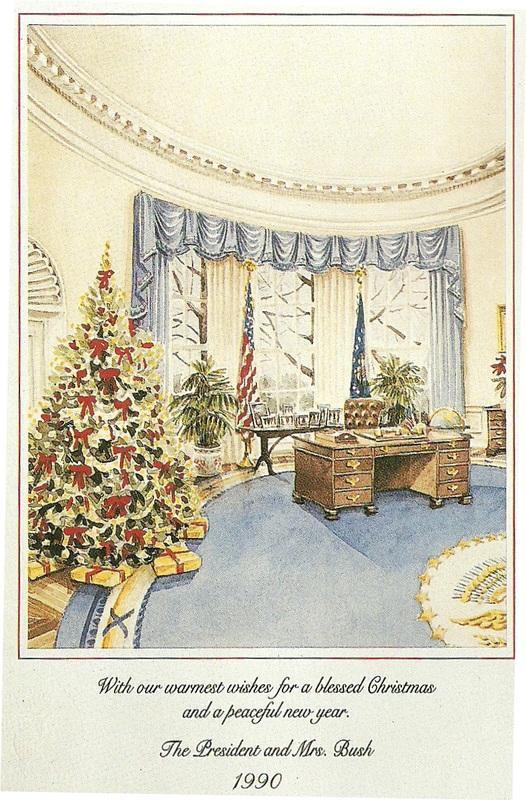 Another Hallmark production was selected by the White House for the 2008 presidential holiday card above. 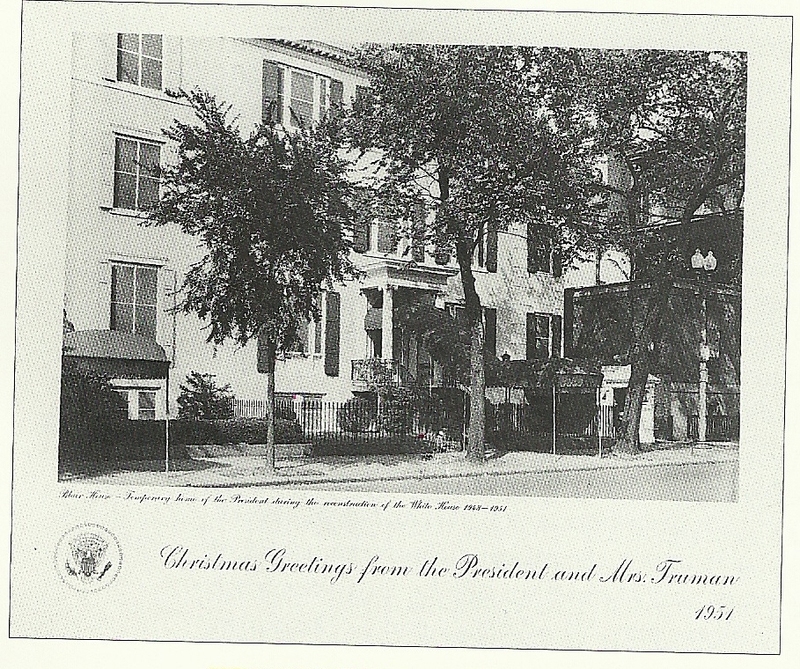 The card image shows a view from the Truman Balcony of the White House. 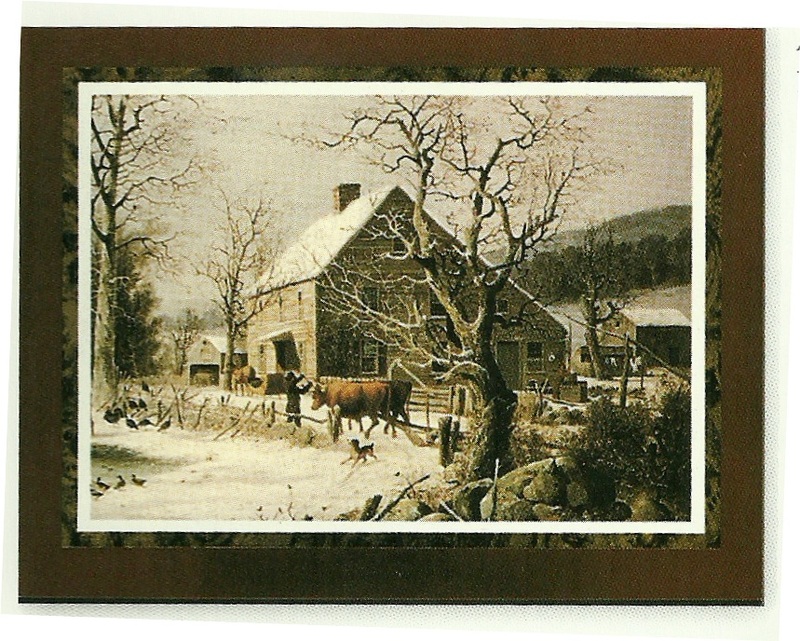 Mrs. Bush selected Maine artist T. Allen Lawson to create the original artwork for the card. As we all take a brief but much needed from break from politics White House 2016 leaves you with these words spoken by Ronald Reagan from the White House in 1985. Woefully incapable of saying it any better ourself, on behalf of White House 2016 we quite simply state, “ditto”. In an overwhelming show of unity and support for her decision, the appointment was made by Governor Haley during a late Monday morning press conference where she, Tim Scott, and Jim DeMint were joined by several Republican members of the South Carolina Republican congressional delegation, and senior South Carolina Senator Lindsay Graham. With praise from all, the decision to have Tim Scott fill out the remaining two years of DeMint’s term was celebrated as one which help ensure that South Carolinians continue to be represented by the same type of conservative values championed by Jim DeMint, who has been considered the most conservative member of both houses of Congress. But filling DeMint’s shoes will not be much of a challenge for Tim Scott who in less than two, already established himself a strong conservative voice. In his first term, Scott turned heads as one of the staunchest supporters of South Carolina’s free-rider-anti-union laws and as South Carolina’s Club for Growth’s scorecard gave Scott a B and a score of 80 out of 100, he is praised by the South Carolina Association of Taxpayers, for his “diligent, principled and courageous stands against higher taxes. It well earned praise for his tireless advocacy for smaller government, lower taxes, and restoring fiscal responsibility in Washington. After winning the general election in 2010, Tim acted upon his desires to regain fiscal sanity in the federal government and to limit its size and scope by acting on such issues with immediately and with urgency. The first bill he authored would defund and deauthorize the President’s health care reform package. e was also named to the influential House Rules Committee, asked to serve as a Deputy Whip and sits as one of two freshmen on the Elected Leadership Committee. Then he confronted our nation’s outdated and cumbersome tax code by sponsoring the Rising Tides Act. That initiative would lower burdensome corporate tax rates that discourage job growth and allow for the permanent repatriation of overseas profits. The latter would encourage American companies to bring home more than $1 trillion dollars that can be used for investment and job creation. In general, Tim Scott is a consistent voice for significant cuts in federal spending, and staunch opponent of measures he believes do not go far enough. Tim was an original cosponsor of the Cut, Cap, and Balance Act, which would do just as it says – cut spending, cap our spending moving forward based on how much we bring in, and add a Balanced Budget Amendment to the U.S. Constitution. He also cosponsored two stand-alone bills that would create a Balanced Budget Amendment, and voted against raising our nation’s debt limit. While Rick Scott is not the only member of Congress who holds such positions, he, like his soon to be predecessor in the Senate, he is one of the few who has been so consistent in those positions. However, while Tim may not be the only member of either house to hold those positions, he is the only African-American in the United States Senate and that distinction will make him a leading voice in the Party, within the conservative movement, and in the nation. Being African-American, Scott will have an incomparable ability to respond to and discount the left’s persistent attempts to paint those who hold his beliefs and political ideology as anti-black. And for a Party that needs desperately to attract Hispanic and African-American voters, the ability to convincingly contradict such mischaracterizations is invaluable. Meanwhile, Scott takes his place in history as only the seventh African-American to serve in the Senate. Coming before him were Hiram Revels and Blanche K. Bruce, who briefly represented Mississippi during Reconstruction. The The first African American elected to the Senate by popular vote was Edward Brooke of Massachusetts. Brooke served two full terms during which he championed the causes of low-income housing, an increase in minimum wages, and promoted commuter rail and mass transit systems. 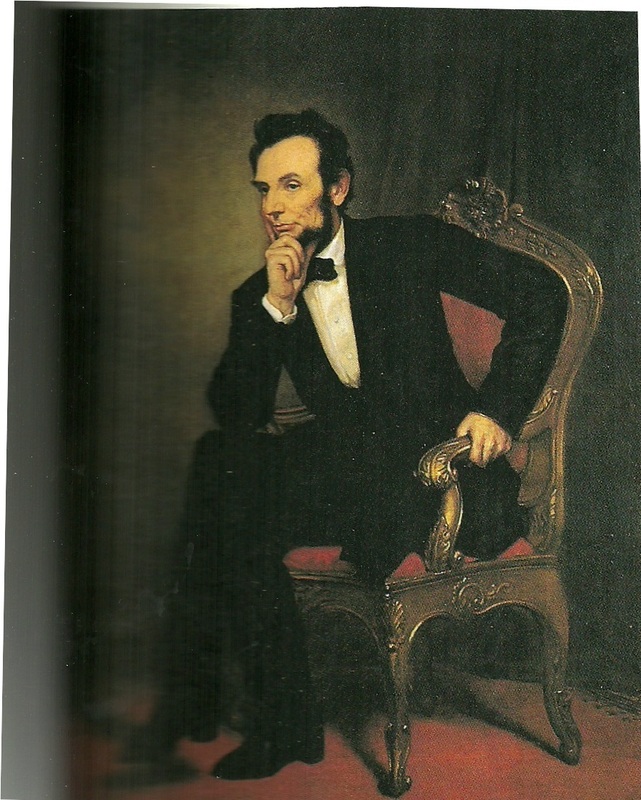 He also worked tirelessly to promote racial equality in the South. Following Brooke in the Senate were Carol Mosley Braun and Barack Obama who were both elected from Illinois. Braun was elected in 1992, a year that saw more women than ever before elected to political office. 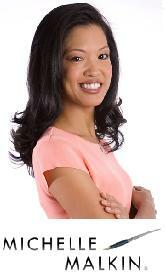 For Braun the distinction was and is that she became the first and only African-American woman ever to serve as U.S. Senator. In 2006, Illinois elected Barack Obama to the Senate and in 2009, after becoming President of the United States, another African-American, Roland Burris was appointed to fill out the remainder of his term. Scott is expected to be officially sworn in to the Senate on January 3rd, 2013 and he has already committed himself to run for election to a full term in the Senate. That race will take place in 2014. On the same day that one replacement is named to the Senate, another seat became vacant as Democrat Daniel Inouye, the U.S. Senate’s most senior member and a Medal of Honor recipient for his bravery during World War II, died at age 88. First elected to the Senate in 1962, Inouye’s tenure is second only to Democrat Robert Byrd of West Virginia, who died in 2010. Under Hawaii law, it is required that the appointee be of the same Party as the person they are replacing. As such the state’s Governor, Neil Abercrombie, a Democrat, will appoint a Democrats successor to Inouye until a special election can be held. State law also requires that the Governor base his decision on a field of three candidates provided by the state Party. The appointee will then serve until 2014, at which point a special election will determine who serves the final two years of Inouye’s term. Some of the names being considered for submission to Abercrombie by the Hawaii State Democrat Party include U.S. Rep. Colleen Hanabusa, 61, who was just re-elected to her second term the House in, and Lt. Gov. Brian Schatz. Other names include Rep.-elect Tulsi Gabbar, the first Hindu-American elected to Congress and who is set to take office in Januar. Also on the list are former Hawaii governors, Ben Cayetano, 73, and John D. Waihee, 66. Odds are though that Hanabusa will get the nod. She is said to have been Inouye’s preferred candidate to take his place one day, and news reports following Inouye’s death have indicated that the Senator informed Abercrombie that Hanabusa should get his job. Congratulations President Obama. So Now What? As of 11:45 pm, with Ohio called for the Obama-Biden ticket, while the states of Virginia, and Florida remain too close to call, President Obama has received 290 electoral votes and secured himself a second term in the White House. For myself, as Editor-in-Chief of White House 2012, I am quite humbled and even embarrassed by the wide disparity in the projections which I presented, and the actual results. And as an American I am disappointed. I am disappointed by the fact that our nation will be hindered by a spender-in-chief who has done his best to change the American way instead of doing his best to preserve the American way. Yet despite the disappointment and even the fear over another four years of Barack Obama, I remain cautiously optimistic that not even Barack Obama can destroy what it means to be an American. This nation is greater than any one person and it is not defined by any one man. So while I have lost some faith in the political process, I have not lost any faith in our nation. Now it is up to President Obama to deal with the divisions in our nation… divisions which I firmly believe he has largely been responsible for. His divide and conquer strategy of class warfare and his attempts to pit Americans against each other in order to win reelection, now puts him in the unenviable position of having to bridge the existing divide. His inability to do so will make his victory a hollow one and the mission of his next four years as President impossible. Not only does Barack Obama become the first President reelected with a smaller Electoral College vote than he was elected with, he also faces an an American electorate and Congress that is probably more divided than it has ever been since the Civil War. After orchestrating one of the most divisive and empty campaigns in recent history, how he will pivot and try to create goodwill will be interesting. And even more interesting will be how quickly he can do it because he must work fast. With a fiscal cliff only weeks away, true leadership is required. His lack of leadership has brought us to this cliff and so far there is no indication that it will be able to avoid it. But hope springs eternal. So tonight I congratulate our President. His campaign put together a brilliant ground game. His Party increased its margins in the U.S. Senate. And except for a loss of seats in the House of Representatives and possibly even the popular vote, he won and there is no denying it. But did America win? And what does his victory mean? Will it mean more of the same that has gotten us into an economic crisis so severe that it is considered a national security threat? I don’t know the answers to these questions but I do know that President Obama’s win tonight leaves us with more questions than answers and more uncertainty than certainty. Some of the first exit polls being released by Fox are showing that Romney is winning working class whites by 55% to President Obama’s 43%. While exit polls usually underestimate trends, if Romney was on a clear path to winning the Buckeye State’s 18 electoral votes, these numbers should be better for him. These early figures are by no means conclusive but if anything they confirm that the race is close. A clear sign that Romney was headed to a victory in Ohio would be that he was winning this demographic by at least 15%. He is not far off that mark and as indicated previously, these numbers are probably understating Governor Romney’s lead with this demographic. But so far, depending upon which side of the aisle you’re in. all signs are that the election may be too close for comfort for Republicans or Democrats. If the election turns out to be as close as predicted in the battleground states, many states will not be called for one candidate or the other for hours. In the case of one of the most critical swing states… Virginia, although polls close there at 7 pm EST, if exit polls from throughout the day and actual returns are very close, we may not know who won till maybe 10:30 pm … some 3 and a half hours after polls have closed. But signs of who may ultimately win the presidential election can still be found by looking at the returns of several key counties in a handful of early states. 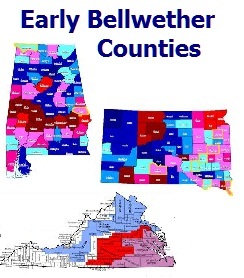 Here are some of the counties in the earliest state closings of the evening which typically act as electoral bellwethers, and what to look for to get an idea as to how things are shaping up for Romney and the President. If Prince William County shows Mitt Romney trailing Barack Obama, Romney is in trouble. If he trails the President by more than 2% here, he probably will have no chance of winning Virginia and he will probably be underperforming in many other battleground states. Romney needs to reverse these numbers if he is going to win Virginia. 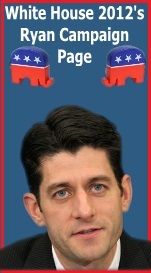 If he can not trounce President Obama in Loudoun County, he can not win the presidential election. These counties will help tell us if President Obama is underperforming. In order for President Obama to be on track to win Ohio, he must produce pluralities that are large enough to discount the pluralities that Mitt Romney will receive on other counties. If the President is not beating Romney in these counties by 30% or more in Cuyahoga, 25% or more in Franklin and Lucas counties, and 5% or more in Hamilton County, than he is in trouble. 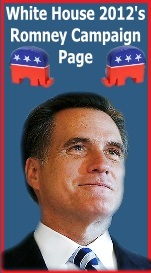 If Obama is to have any chance in Florida, he must come within at least 5 percentage points of Mitt Romney. The President will not need to be ahead of Romney here, but if he can limit Romney’s lead in Pinellas County, the President will be underperforming and is not likely to see him defeat Romney in the final numbers. If he is to be competitive in The Sunshine State, Romney needs to produce at least a 5% plurality over the President in Hillsborough and that is cutting is close. To really feel confident about which way Florida will go, Romney should optimally lead Obama by as much as 8%. If we get news that Romney or Obama are leading the other by 3% or more here, it may not be an accurate measure of national trends and the final popular vote but it will certainly be a sign of which way New Hampshire will go. Romney needs to take Chester County by 7% or more if he is to win Pennsylvania. Anything less than that will make the race too close to call and likely a win for President Obama. If Romney has any chance to win Pennsylvania, he needs to win Bucks County or hold President Obama to a 4% lead or less. 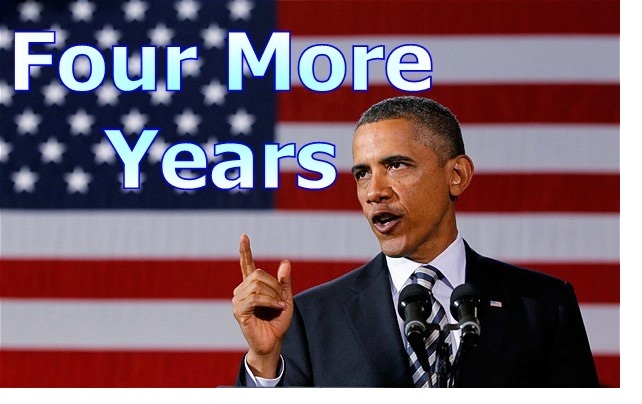 President Obama will be in trouble if he does not win Delaware County by at least 55%. If President Obama does not see at least a 10% lead over Mitt Romney here, than the race in Pa will be too close for comfort for him. Romney needs to win this County by 15% or more to be in the running for Pennsylvania’s electoral votes. Below the poll closing times you will find a White House 2012 timeline which includes when each state will probably be projected for Governor Romney or President Obama and it also provides an estimated running total of the Electoral College that each candidate probably will have at the top and bottom of each hour. 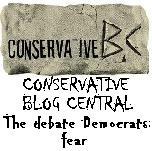 Candy Crowley is known for jumping the gun on her conclusions. In the presidential debate she moderated she even took sides as she interjected herself in to the debate by claiming President Obama did call the attack in Benghazi an act of terrorism, even though he didn’t. But today, on her Sunday morning CNN talk show, Crowley accidentally let slip the phrase “President Romney”. Crowley quickly corrected herself but before backtracking, did she let the cat out of the bag making with a slip of the tongue that used a phrase she was subconsciously thinking about an accidentally substituted for the title that she meant to give Governor Romney? Probably not, but it was good practice for Crowley who in less than 48 hours, will have to get use to saying “President-Elect Romney”.